I set up a website and Google suddenly started sending search traffic to my pages, boosting my ad revenue by a significant amount. Just as suddenly, the search traffic dried up, sending me back into the gutter with the rest of the low-page-rank bums. Read on for the details and graphs. A few months ago I got my period itch to throw together a new website in my spare time. While trying to figure out what to do, I ran across the US Census Bureau's Zip Code data set while browsing Wikipedia (see their article on Zip Codes for more than you'd ever want to know about the history of postal zones). The data is a list of every Zip Code in the US with its population, longitude, latitude, city, and state. It's hard to resist parsing a huge batch of data, as I'm sure you understand, so I wrote a script to jam it into a few useful database tables. I now had something to get my website project going: a list of 25,701 US cities and 29,467 Zip Codes. That's not an exhaustive set, I'm sure, but it's good enough for government work. I also found the populated-weighted geographical centers of cities so I could find the distance between cities. Limiting the results to cities within 100 miles of each other, I still came up with over 6 million pre-calculated distances. My poor PowerBook was chugging all night working that out. The vast majority of my traffic comes from Google. After that weekend, I pretty much forgot about the websites and the world pretty much ignored them. That's not much of a surprise, since I only linked to them from the sidebar of my blog. I did, however, set up a Google Sitemap, telling the search engine about the 25,000 or so pages I had set up, one for each city in my database. 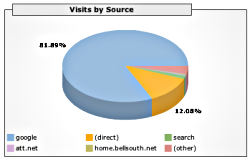 Google did what Google does and started crawling my site, and I found a hit every now and then resulting from Google searches like "looking for job in hernando, ms" and searches for other places in the long tail of US cities. The traffic was sporadic and resulted in fewer than two Google ad clicks per week through the end of August. At that rate, it would take a month to buy a cup of coffee. My visits jumped dramatically for a period of 5 days. Then, on September 9, my site's page rank must have gotten a boost, because the traffic coming from Google searches jumped significantly. I didn't notice until two days later, at which point I tweaked my ad placements. 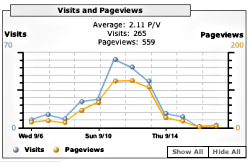 I went from 2 clicks a week to a peak of 10 clicks in a day. That's still not enough to retire, but it would by me a grande latte at the local Starbucks. I got a bit excited thinking about how I could actually make the site useful and increase the traffic even more. Just as suddenly as the traffic spike, Google changed its mind about the page rank of my site. Visits returned to their former trickle, and with them went my dreams of a daily subsidized espresso drink. Most of all, though, this episode gave me more insight into importance and power that Google holds over the fortunes of those trying to do business over the web. I certainly don't begrudge the search engine for dropping me in its results, but for someone trying to actually make a living from their website Google can make them and Google can break them. 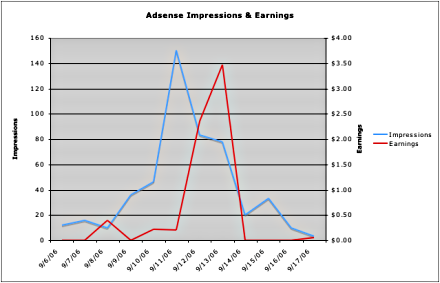 My ad impressions and earnings jumped with the traffic. The earnings lagged a bit until I tweaked the ad placements. It looks like I missed out on the biggest days.